Beginning next month, characters from the upcoming Disney animated film “Frozen” will begin meeting and greeting at Disney’s theme parks in Florida and California. Today Disney released a first glimpse at what these characters will look like. At Disneyland, sisters Anna and Elsa will be meeting in a new spot in Fantasyland while at Walt Disney World the pair will appear at Epcot in the Norway Pavilion, alongside a gallery of Norwegian culture that helped to inspired the film. The Norway meet-and-greet will continue through January 4, after which it is not clear where Anna and Elsa will end up. Disney has said there are no current plans for Olaf, Hans, or Kristoff to appear in the parks. In addition to character meet and greets, “Frozen” will also be shown off in the parks with a special Christmas time version of World of Color hosted by Olaf at Disney California Adventure as well as a new sequence of the Celebrate the Magic projection show at the Magic Kingdom. “Frozen” slides into theaters on November 27. YES! So glad they are going to be in the Norway Pavilion, was going to scream if they put them in Germany like they did with Rapunzel. 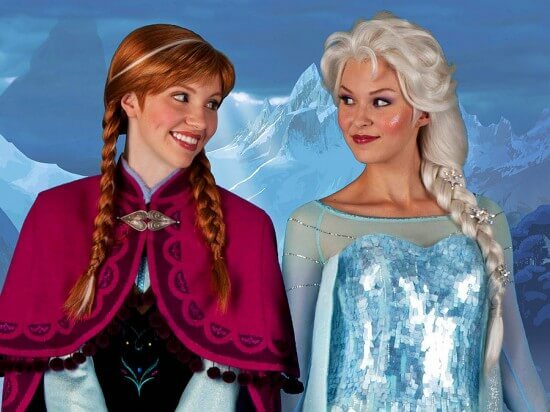 Any idea where in Disneyland’s Fantasyland Elsa and Anna will meet and greet? I was just there on Sunday and didn’t see anything, although I’ll admit that work could have started today. Dallas: Although “Tangled” was set in an undetermined European location, the “Rapunzel” fairy tale has a German origin. I was surprised when I found out Aurora has meet-and-greets in France, as “Sleeping Beauty” was set in England, but the tale has a French origin. Any story with Brothers Grimm roots is considered “German”, which is how Snow White ended up there. The Grimms didn’t even come up with most of those stories, though, just retold them. And, fun fact, Sleeping Beauty, is both French and German, based on versions written by both Perault (French) and the Grimms. (German.). Disney’s version is actually based off the ballet, which is most frequently set in Russia despite the characters (Aurora and Carbose, the original name for Maleficent) having Spanish names. I found out from the Parks blog–as an answer to my question–that Elsa and Anna will go into the “cottage” next to the Pinocchio ride where Rapunzel currently meets and greets. Rapunzel will move to the Princess Fantasy Faire town square. In Epcot, they place the characters where their stories originate. Beauty and the Beauty takes place in France, so the characters are in France. Frozen takes place in Norway, so the characters are getting put in, you guessed it, Norway. Make sense now? There already having meet and greets with characters and the movie has not even come out yet. Will Anna and Elsa can meet and greet at Hong Kong Disneyland in this Christmas? Hi we are going to disney Hong Kong too in April, can anyone tell us if Elsa and Anna are there please? My children would be so happy! Why does Elsa’s park wig appear pure white while the dolls, merchandise, and trailers clearly show her hair to be platinum blonde? Suppose it’s just the lighting? Her hair changes color during the movie. It all makes sense when you see it. Actually, it’s Anna’s hair that changes color, not Elsa’s. Are Anna and Elsa going to be permanent? We will be in wdw from 1/31 to 2/19, hoping they will be there. these women are vary ugly but “Elsa and Anna” are so beautiful!!! Hi my name is aimee i love you anna and elsa . I wish i could meet the character’s of Anna and Elsa and i wish i could get elsa’s dress and i’m only twelve and i will fit in size 14 of kids. I really love the movie FROZEN. it’s the best movie in the world i’ve watched it about 10 time and i can’t get enough of the movie because I SERIOUSLY LOVE FROZEN. Do you guys love frozen the movie? You probably require a refresher for the useful tips every online company owner should know about. So unless any company completes the formalities and get the necessary certifications they could’t start their business. an excellent job avoiding being taken for the sucker and I’m here to tell you, Ameriplan just isn’t a scam. Often we hear experts on television that report a specific stock is gonna soar and now could be the time to purchase. So unless any organization completes the formalities and find the necessary certifications they’re able to’t start their business. amend your wweb site, how could i subscribe for a weblog webb site? to check out your site on my iphone during lunch break. I really like the info you present here and can’t wait to take a look when I get home. guy is a breast man. that both sports are being played with 11 players on the field, the similarity ends here. Without insurance coverage, the average or low-income family is quit in all such unfavorable circumstances. Banyak yang kecewa mereka telah diremehkan untuk permainan mangkuk yang lebih besar. Evaluasi kemungkinan tim secara obyektif dan tidak berdasarkan emosi. Tidak ada yang salah di sini karena orang hanya perlu memiliki sesuatu yang semarak.